A step above our basic package. The client asked to create Custom Graphics showcasing Golf Course Amenities. Our Graphic Design Team was given artistic freedom to "go all out" and create a show boat for their Sales center as a large Poster format, on their website and also on brochures and flyers. 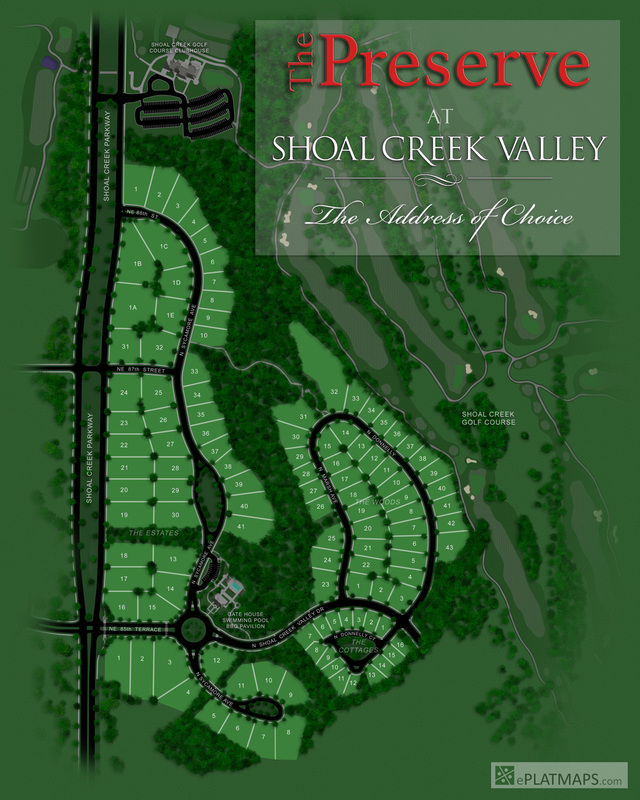 By posting the map on our website we can direct clients and prospective clients to this site to answer questions about which lots are available, pricing, lot descriptions and if there happens to be a home we are listing we can also post information on the home and add a link to HMLS and photos. This is a great marketing tool to show prospective sellers, buyers and developers. Adding the map and combining it with our website was a much bigger time saver than what we ever anticipated. By directing clients to the website for map information they are also being informed about our website and all of the additional information we have to offer such as a list of "Preferred Builders', New Communities and Current Listings to name a few. The maps not only look amazing they give your business a boost as a marketing tool. Tom Johnson, my business partner, and I have an information box for each neighborhood subdivision. In this information box we fill it with marketing folders which include a current printout of the EPlatMap, Welcome Letter, Marketing Flyers for Listings within the neighborhood, New Resident Magazine for Kansas City (by the way which Tom and I have the largest distribution of this magazine within the KC Metro) and any other pertinent information. We have also had colored labels made of our website that we attach to the packet where the individual can find the EPlatMap. ©2000-2019 ePlatMaps - CO2 Consulting Group, Inc. All rights reserved.